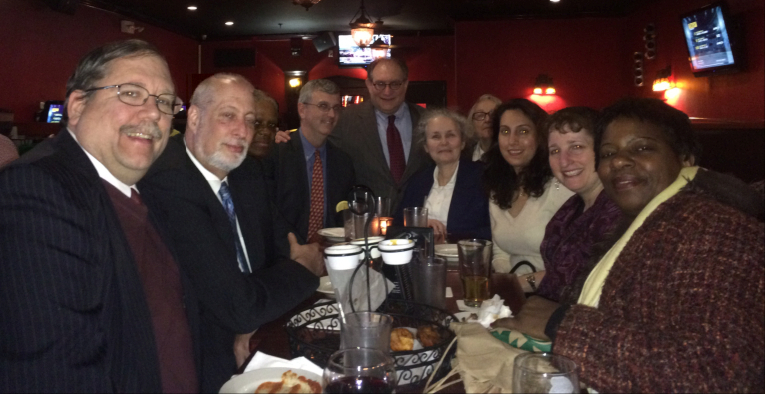 The NYC group getting together for drinks and apps last night from 5:30-7p at the Dark Horse before the board meeting. Pictured from left to right: Judges Mevec, Tolciss, Farrow, Stephens, Zaidins, Bernhardt, Murphy, Georgiades, Schwartz, and Anekwe. The Next board meeting is scheduled for June 21, when we’ll be continuing our discussion on plans for hosting the October 2017 NAALJ annual meeting in Manhattan. Our next quarterly meeting is coming up and all members are invited to participate. The big item on the agenda is whether we will be hosting the 2016 NAALJ Annual Conference. The meeting will be held simultaneously in Albany and NYC via teleconference. and, as always, You will need to RSVP. Details have been emailed to all current members. If, for some reason, you did not get the email please let me know and I’d be happy to make sure you get the info.